The DannyJazz Quartet is the jazz combo around the saxophonist Daniel Gaggioli. 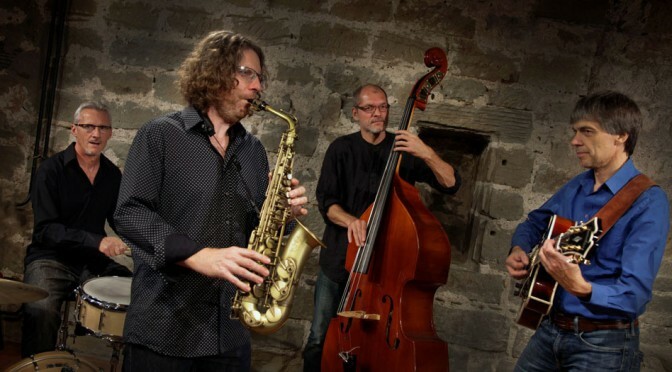 The unusual line-up – saxophone, guitar, bass and drums – creates a light and elegant sound. The band masters ballads with depth, up-tempo tunes with esprit and cool latin grooves. Daniel Gaggioli is able to compose catchy and melodic themes which allow the listener to day-dream and the musicians to have freedom for improvising. The band started in 2012 as a trio without drums and became a quartet in 2016. Gigs in Switzerland and other European countries helped the band to gain experience and to find it’s own style. One important concern of the band is to experiment with additional instruments and to rearrange the original compositions by adding guest soloists like Franco d’Andrea (p), Jérome DeCarli (p) and Martin Kissling (dr). The debut CD Gymnosphère was recorded in summer 2014. The album was prepared in Meran (South Tyrol, Italy) and reflects perfectly the atmosphere of the Mediterranean Alps. The second album Sunday has been released in September 2018 and features singer Mandana.